Wicked Bee Apiary and Removal Service is located in Austin, TX. We specialize in rescuing and rehoming Honeybees who might have chosen to establish their new colony in a location that is not so copasetic with the property owner. These bees might otherwise be met with an unfortunate end due to lack of knowledge by the general public and/or pest control services. With the current state of our environment and the plight of the Honeybee and other natural pollinators, that scenario would be very unfortunate indeed. This is where Wicked Bee comes in. We work to remove the Honeybees that could otherwise become a nuisance, and we do it in a way that helps to ensure the survival of the colony. These bees are then taken back to one of several out-yards managed by our apiary where they are used to help cultivate good quality survivor stock that is already adapted to our native climate. We believe in an all-natural approach to beekeeping that is treatment free and chemical free, allowing the bees to adapt to their environments the way nature intended. Ultimately, this helps promote the return of Honeybees that have stronger genetics and are capable of being naturally disease and mite resistant, the way nature designed them to “bee”. John Swan is the owner of Wicked Bee Apiary where he manages an average 40 honeybee hives, provides training and consultations for other beekeepers, and hive management services for land owners. From the hives at the Apiary, John produces his unique line of Wicked Bee Honey products. 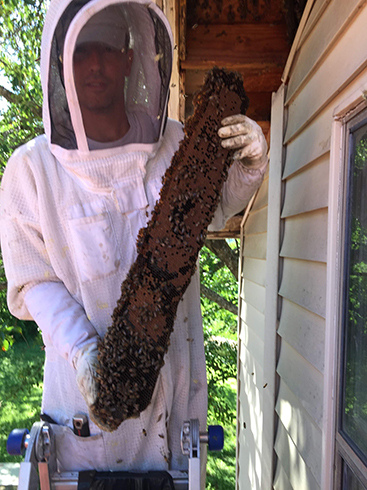 He is also the owner of Wicked Bee Removal Service which was created to help save honeybees from unnecessary extermination by providing live removal and relocation services when bees setup a colony in an undesirable location. Each year this service saves an average of 142 feral honeybee colonies from extermination! 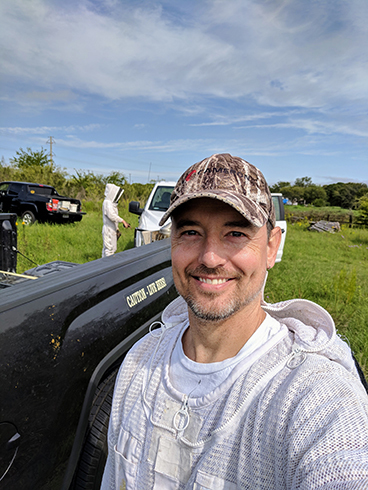 John is currently serving on the Board of Directors for the Texas Beekeeper’s Association for 2019, as well as serving his 3rd consecutive term as the President of the Travis County Beekeeper’s Association. John is also member of the Texas Master Beekeeper’s program, and a board member for the Austin Area Garden Clubs at Zilker Botanical Gardens. When he isn’t playing with his bees, or rescuing other bees, John is talking about bees and helping educate people about their importance.